The large print numbers "1792" have seemingly stared at me from the shelves for years. The bottle provides little information on the front label--no backstory, no age-statement, not even the name of the distiller. Although that is, in some respects, a bit refreshing (marketing only what's inside the bottle for the most part), I nonetheless put off trying this one until now. After having finally found my way to the bottom of this bottle, I wish I had picked it up sooner. Upon first opening the bottle, I knew I had a good bourbon here. I was hit with caramel and vanilla, along with the distinct scent of orange peel, a blend that made my mouth water. There was also a slight pipe-tobacco scent that was subtle, yet very inviting. The flavor was a bit softer than its nose. It's a relatively simple, somewhat watery bourbon. The most prominent flavors were burnt sugar and vanilla, set against a cereal backdrop. Surprisingly I was hit with a hint of black pepper spice towards the end. Although I considered this a simple bourbon, it increased in complexity after being open for a bit, the flavor eventually catching up to the nose. That pepper spice developed into a richer, more familiar rye spice that presented throughout, from the beginning of each sip to the finish. Also, the flavors seemed to hang around a bit longer than they did initially. Most noticeably, a butterscotch flavor seemed to hang at the back of my throat, making this very enjoyable. This was an interesting bottle. The nose promised more than I initially got from the bourbon. However, after leaving it open for a bit, the flavor profile changed considerably for the better. It was a lot like Old Grand-Dad 114 in this respect. I'm not going to tell you that this is a great bourbon and you need to run out and get a bottle. 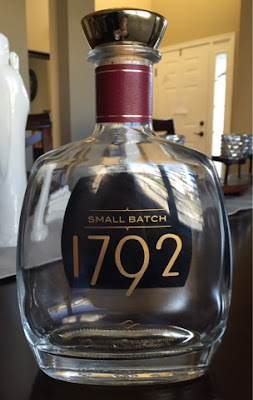 However, my verdict is that 1792 is certainly near the top of my rankings for bourbons in the $25 and under price range, and one I would buy again.